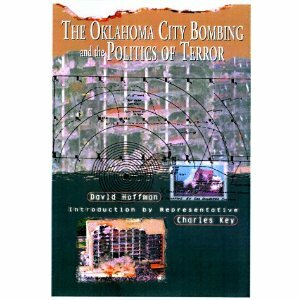 Among Feral House’s and Process Media’s wide-ranging array of titles are some conspiratorial books looking into the Oklahoma City Bombing and many other questionable aspects of the establishment line. For The Oklahoma City Bombing and the Politics of Terror, we were sued for libel by Oliver “Buck” Revell, the FBI’s Deputy Chief. We were prepared to raise money to fight this case to protect the integrity of Feral House. We met with the former head of the ACLU in his penthouse ocean view office in Santa Monica. He said he’d help us out by only charging a one hundred thousand dollar retainer fee which, of course, we couldn’t afford. PEN refused to take on the case. Then the book’s author, David Hoffman, admitted that he no longer possessed a recording of Flight 103’s victims’ attorney asserting that Mr. Revell had told him that he plucked his son from the Pan Am flight just before its ill-fated bombing above Lockerbie, Scotland. This was our evidence. The attorney in question “didn’t want to get involved in this legal case” and author David “recorded over” the tape. Well, that took the piss and fight right out of us. To settle, we were forced to put this book out of print, and FBI men actually appeared at my distributor’s warehouse to watch them incinerate all remaining copies of the book. Mr. Revell claimed that his son changed his flight from Pan Am 103 at least a day or two, and not hours, before its tragic conclusion. David Hoffman made my life difficult for a while, but his life became even worse. And now he’s dead. A couple years ago we were sued about a chapter in Alex Constantine’s book, Psychic Dictatorship in the USA. The suit was a strange one: filed in a Utah small claims court by a man unfortunately named Robert Wadman, an ex police chief of Lincoln, Nebraska, where he was accused of various misdeeds that figured highly in the book, The Franklin Cover-Up by John DeCamp. DeCamp’s book was about the use of children from Boys Town as party favors for Republican Party VIPs. What a sordid tale. Author DeCamp, by the way, was a Republican State Senator in Nebraska. Wadman’s evidence against Constantine and Feral House was thin and misleading, and as a result we won that case even among Mormon brothers in the middle of the Mormon state. We’ve been stalked and intimidated by other folk and organizations at other points throughout the decades. Strange and mystifying things have happened to us due to the subject matter of a coming title. As a result, we certainly understand why people remain suspicious of commonly-held beliefs broadcast by government officials and the media at large. But it seems that many of the new conspiracy-lovers are handed information to believe by powermongers with ulterior motives. For example, many doubters are troubled by media reports about George Zimmerman’s killing of Trayvon Martin. To this moment, Zimmerman has killed a black teenager with impunity. The doubters believe that media interest in this case is all to do with falsely accusing a white man. Or in Zimmerman’s case, non-black. It’s extremely important for these particular doubters that Trayvon Martin is seen to be a thug and Zimmerman a victim of “lamestream” media. I was told the other day by such an individual that Trayvon Martin didn’t even possess tea or Skittles from a local 7-11. This was yet another “liberal media invention.” Well, unfortunately for this doubter, the disappearance of the Skittles was an invention of a right-wing blogger. This same morning I was told by another blog poster that media revelations about a fast-melting Antarctic shelf is yet another liberal media invention made to personally enrich Al Gore by overtaxing Americans. Does it matter that satellite images back up this story? Not at all, the USGS is all part of the conspiracy. It seems to me that this country is going through mass hysteria… let’s not even get to the presidential election. Do you remember the reaction to Orson Welles’ The War of the Worlds?